Next up on the IndyCar calendar is the scenic street track of Long Beach, California, a track which no one has managed to dominate over the last few years. With just under 2 miles of streets and 12 turns, Long Beach has lots of overtaking opportunities, making the races here very interesting and often chaotic. Takuma Sato and Rahal Letterman Lanigan will be heading into this weekend on a high after their win at Barber Motorsports Park. RLL will want a good result all round at Long Beach, rather than just on one side of the garage, as was the case last weekend. Graham Rahal suffered an issue with his Honda engine that left him stranded on the track. This amounted to the sixth Honda-related failure in just three races, compared to just one Chevrolet issue, meaning Honda has still got some reliability issues to see to. Despite this, Honda has won two of the three races so far this season with Sato and Colton Herta both taking victories. Chevrolet holds the championship lead, though, with Josef Newgarden sitting 27 points clear at the top of the standings, having won at St Petersburg and finished second and fifth in the following rounds. 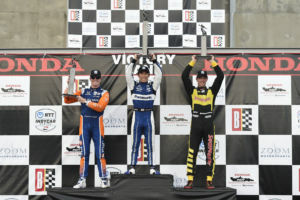 Scott Dixon is second in the championship and Sato’s victory at Barber has elevated him to third, while COTA-winner Herta has dropped to fifth after suffering from reliability issues at Barber. Barber itself was almost entirely dominated by Sato, who led for 74 of the 90 laps. He made a mistake towards the end of the race and ran off track, giving Dixon a chance at the win but the reigning champion could not capitalise on the mistake, settling for second for the sixth time at Barber. This means Dixon is yet to win a race in 2019 but this is hardly anything to worry about given he didn’t take his first win in 2018 until the seventh race, and that didn’t exactly stop him going onto win the championship! Unlike other tracks, Long Beach has not had any single driver or team dominating in recent years. Alexander Rossi won last year’s race from pole – the first driver to do so since 2007. The race was incident-filled with four caution periods, but Rossi held firm throughout the 85 laps and to take one of his most convincing wins to date. 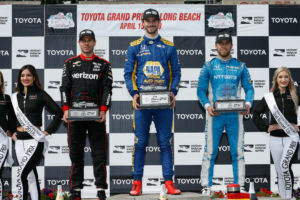 The last four races at Long Beach have been split between Honda and Chevrolet, with neither manufacturer having a clear advantage – adding to the excitement of this track. This is the second street race of the season and will follow the same weekend format as all the races so far with the two-group qualifying eventually ending in the Fast Six. The grid is back down to 23-cars for Round 4 as Ben Hanley and DragonSpeed are not competing again until the Indy 500. Other than that, everything is the same as it was at Barber. As Long Beach is back-to-back with Barber, it’s unlikely that Honda has found many solutions to the problems experienced last weekend, meaning Honda unreliability could again be a factor this weekend. Dixon, Rossi and Will Power are all after their first wins of the season, with Rossi coming in as the defending Long Beach champion. Rossi is, in fact, looking for his first podium of the season as the highest placed driver in the championship without one, something that he will want to set straight in the next few races, especially with the Indy 500 on the horizon. Previous PostPrevious WorldSBK: Can Bautista be Toppled in Assen?